Garance and I will be at Colette today from 3 to 4pm, to sign t-shirts from her Gap collaboration and meet our readers. If you are in the area please stop by, we look forward to meeting you! PS. You’ve gotta read Garance’s post today, it’s so funny (especially the part about Anna Wintour). Awww, you guys. I wish I were there. I'll be in town on the 3-8th of Nov. Let me know if there's anything about in that point in time! Would love to but I will be at the London Gap store instead. Whoa. I REALLY want to be at this. Have a great day at Colette! I wish I could make it, tell her to come to Tokyo next time! Why I'm sooo far? I would love to meet her!! RRRRRhhhh I need to leave Paris at 2…Damn. I would love to see both of you and the famous T-shirt! Very cool. So far away from there, but hope you guys have a great time! Why oh why am I not in Paris right now? You guys have to come to Switzerland! Or at least Milan! She's so skilled. Her work is amazing. I wish I was there! 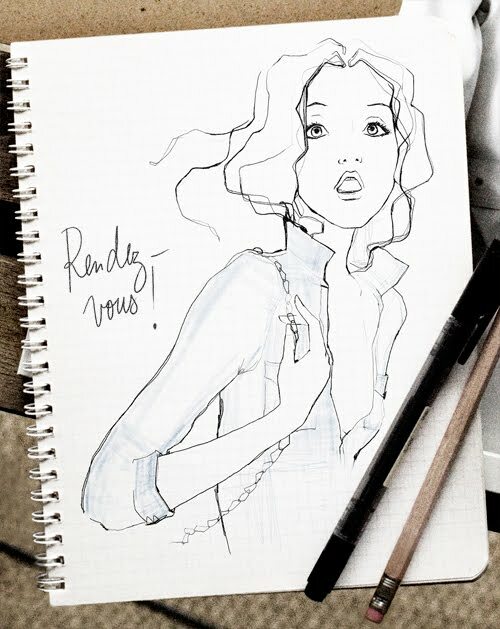 I would love to have a t-shirt of Garance illustration!! oh, wow! this is an amazing picture. i love the style of the drawing… i am now thinking that i should take my art in this direction. first comment!!! yey for living in Australia (different time zone)!! I'd love to, she is great with a good sense of humor I love her blog…but why you two don't never come to Rome? aww i wish i could go!! ps:love the expression in the eyes. I did read Garance's post and you are right, she is very funny! Ahhh to be in Paris! omg… congrats to Garance! Beautiful image. Wish she was in NY – next weekend – when I'm heading back there. aah, this year, I've been missing all the good stuff everywhere! merde. I'm so annoyed that I no longer to living in Paris. Meeting and having my book signed by you in NYC was amazing, meetikng Garance and having her sign my book as well… EPIC. What a beautiful beautiful talented and polite woman. Will the same thing be happening in the UK? I absolutely love this sketch and have been staring at it most of the day. Any chance you have a high res version? I'd love to ink it in photoshop. i ordered your book through Amazon – had a peek read at shop in the International Centre for photography NYC…had way too much weight to bring back to Australia otherwise I would have stocked up on books! She is funny and charming and real. No wonder she is so well-loved. oh. my. god. that is beautiful! i love her youthful look and mussed up hair! First Book Signing at Colette! The Sartorialist Exhibit at Colette! !